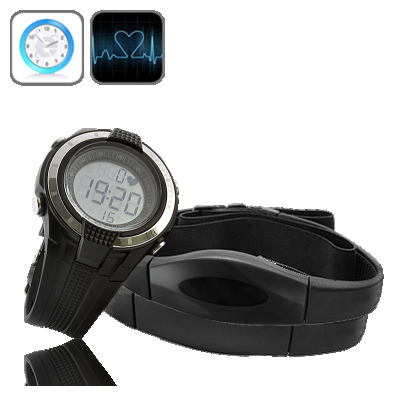 Successfully Added Heart Rate Monitor Watch with Chest Belt to your Shopping Cart. New digital heart rate monitor consisting of an exercise watch and chest belt to track your heart rate during daily exercise routines. With cordless transmission between watch and chest belt, this is the easiest way yet for you to see your progress while you are exercising. 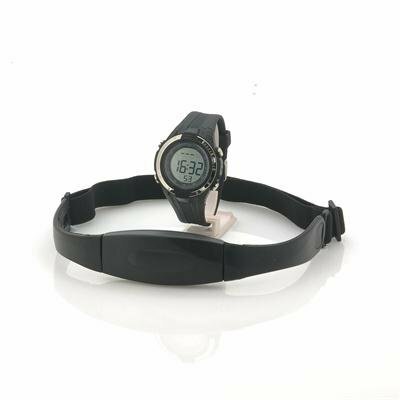 The digital wrist watch will let you read your heart rate (also called BPM - beats per minute) while also operating in a stopwatch mode. You can even program the exercise watch to suit your body weight and height and alarm you when heart rate goes beyond an upper heart rate limit ceiling you preset. This is a great choice for exercise enthusiasts looking for exact readings of their pulse rates and is also very helpful for older individuals that need to be aware of their heart rate, especially if they have conditions or medications that make knowing their current pulse very important. A wonderful electronic health tool at a low wholesale price, what a great way to help kick start your new health goal! In stock now, we guarantee next day shipping and offer a 12 months warranty on all our products. Brought to you by the leader in electronic devices and personal / health gadgets, Chinavasion. Smart exercise routines start gradually before becoming intense. For those over the age of 60 it is recommended that you use the devices MAX HEART RATE ALARM function to make help monitor your workout.